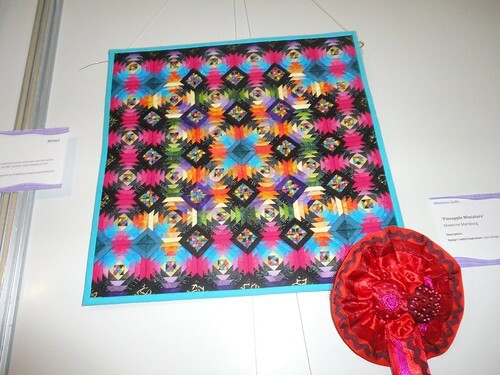 In July, Cape Town hosted an International Quilting festival. 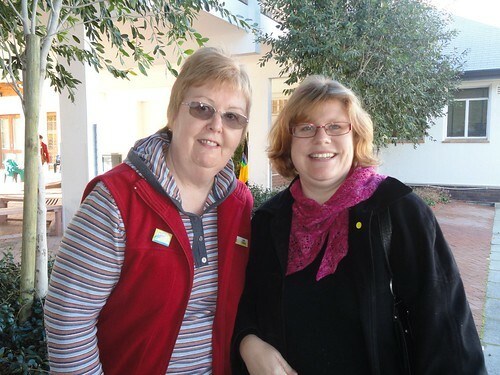 One of my blog readers let me know that she was coming from Australia to attend the festival and so we made plans to meet up. Jenny arrived with some Sanitarium Marmite (the recipe is different from the Marmite sold here) and some Cherry Ripes which were most gratefully received. Jenny actually lives in one of the towns that I lived in when I was in Australia, but we didn’t know each other then. Here we are at the festival. The quilts were amazing. Since I no longer belong to a guild, I don’t get to see quilts in person anymore, so it was nice to get up close and personal with quilts instead of viewing them on a computer screen. 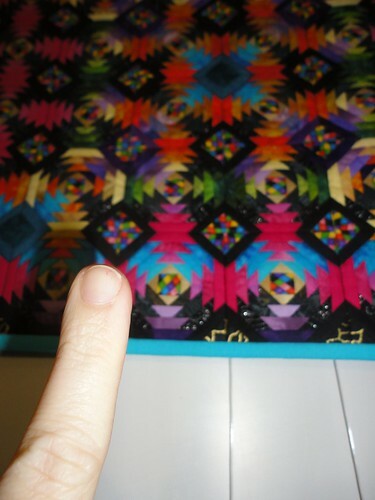 And with my finger for scale (please note I did not touch the quilt at all). I can’t even begin to imagine how to make something that small. 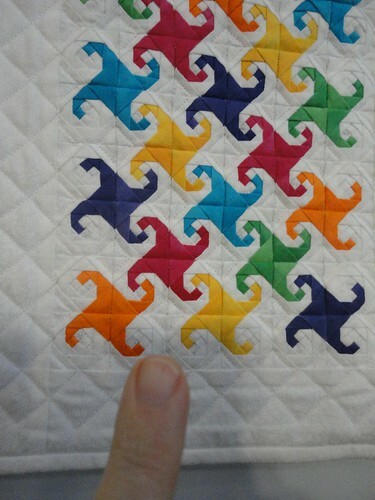 The quilt show did prove that I’m more of a knitter than a quilter though. Carle and Dana had a stall in the shopping area at the festival and I filled my bag with yarn in about 10 minutes. (I did have a list and was shopping for specific projects, but still). I did buy a little bit of fabric in some lovely bright colours which I will mostly use for soft toy making, but most of my money that day went on yarn. I have been quilting though, I’ve been working on finishing a quilt that the mother of a friend of mine started about 15 years ago. That’s been an interesting challenge. 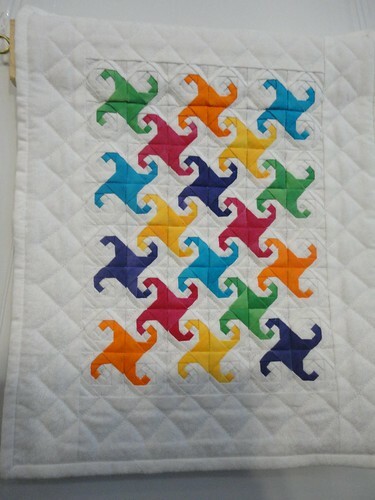 I’ve just gotten it back from the long arm quilter and need to put the binding on and then I can deliver it to her. The creation of small things continues here at Ruthsplace. (Though there is a cardigan for Gorgeous Girl and one for me on the needles at the moment). My brother’s wife is expecting a baby any day now. 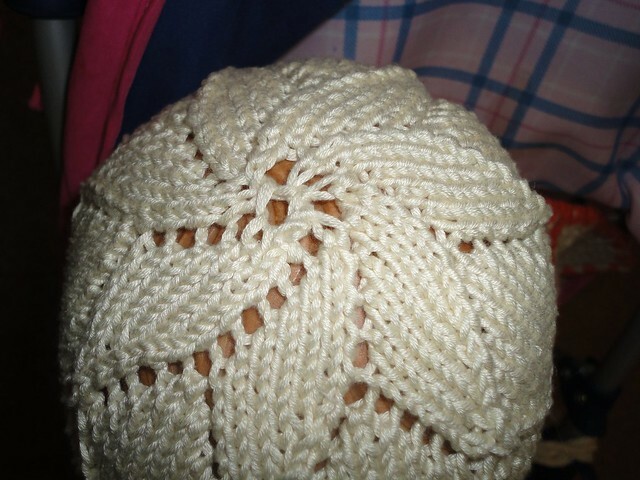 I’ve knitted a small hat. And the view from the sides. 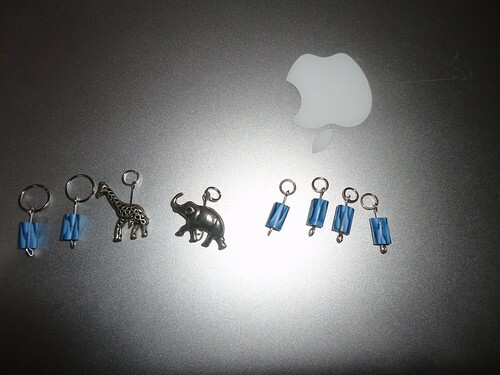 I dusted off my beading supplies a few weeks ago and made some more stitch markers. Gorgeous Man recently bought me some patterns from the very talented Two Little Banshees. He bought the elephant, the hippo and the platypus. So far Gorgeous Girl and I have made a baby platypus. Gorgeous Girl is the artistic director and selected the fabrics and the felt for the nose. 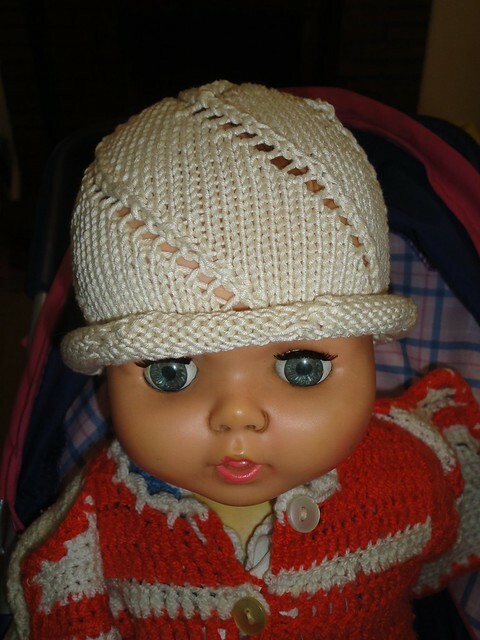 Mummy is just the piecework hack who puts it all together. 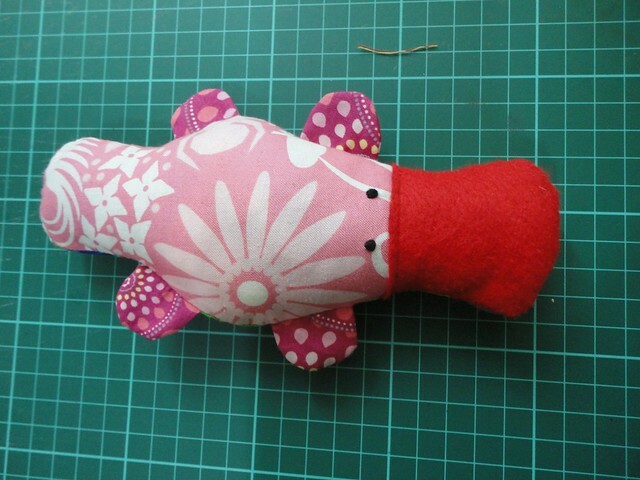 I’m hoping to find some time on the weekend to make some more of these as well as a larger platypus. The pattern is really clearly written and easy to follow. The Two Oceans Aquarium is a wonderful place to visit and on the weekends they have free activities for the kids. 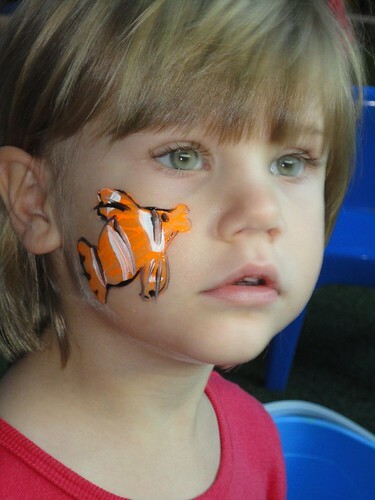 On a recent visit Gorgeous Girl got her face painted. 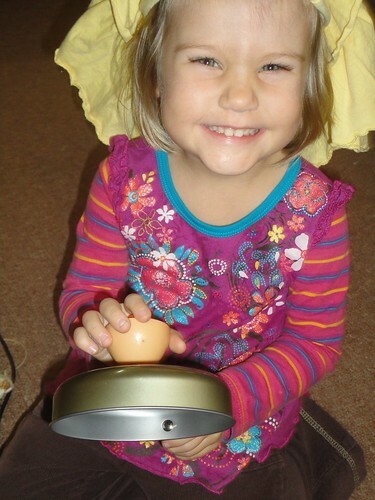 Gorgeous Girl put a skirt on her head last week and declared she was a chef.